How lucky we are. 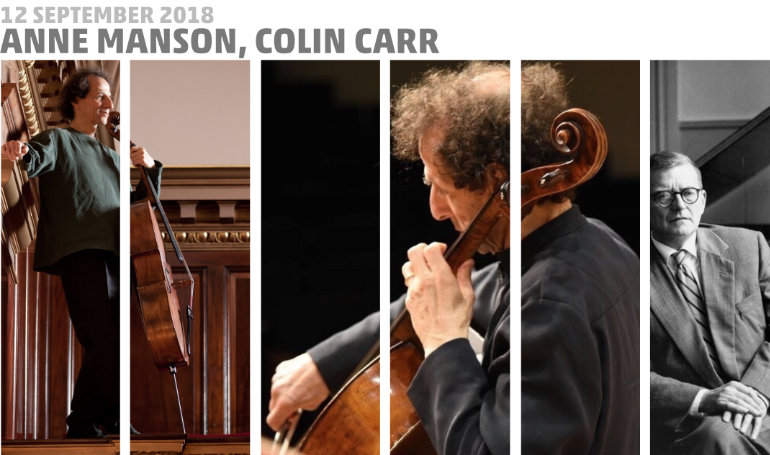 For the past few years, cellist Colin Carr has made occasional visits to the Canadian prairies in between performing for packed houses in Europe alongside the likes of Sir Simon Rattle and the Royal Concertgebouw Orchestra. He joins the MCO for our season-opening concert, starting 2018/19 with a bang. Carr’s concerts here are received with great fanfare, with the Winnipeg Free Press noting his consistent ability to inspire “roaring standing ovations” and the Calgary Herald gushing that Carr delivers “some of the most memorable performances we will ever likely hear in this part of the world.” A player of powerful conviction and rare virtuosity, he has become something of a celebrity among Winnipeg music-lovers. Not one to shy away from the blockbusters of the cello repertoire, Carr delivered a riveting sold-out performance of Schumann’s Cello Concerto in A Minor at a sold out MCO concert a couple seasons back. He’s selected a cello concerto of equal stature for this concert: Shostakovich’s Cello Concerto No. 1, widely regarded as one of the most technically difficult pieces for the instrument. From its driving use of his famous DSCH motif in its opening to its frenzied finale, Shostakovich’s first cello concerto is a work of intense drama whose suspense is increased by its interceding slow movements. But this is no showpiece. Rather, it’s a work of incredible depth peppered with the political allusions that helped make this restless Soviet composer an object of fascination for scholars — and one of suspicion for Soviet authorities. The concert begins at 7.30pm on September 12th in Westminster United Church, 745 Westminster at Maryland. Tickets, at $35 for adults, $33 for seniors and $15 for students and those under-30 (incl. GST), are available at McNally Robinson, Organic Planet (877 Westminster Ave), and on MCO’s Ticketline at 204-783-7377. Colin Carr appears throughout the world as a soloist, chamber musician, recording artist, and teacher. He has played with major orchestras worldwide, including the Royal Concertgebouw Orchestra, The Philharmonia, Royal Philharmonic, BBC Symphony, the orchestras of Chicago, Los Angeles, Washington, Philadelphia, and Montréal, and all the major orchestras of Australia and New Zealand. Conductors with whom he has worked include Rattle, Gergiev, Dutoit, Elder, Skrowasczewski and Marriner. He has been a regular guest at the BBC Proms and has twice toured Australia. With his duo partner Thomas Sauer, he has played recitals throughout the United States and Europe, including in New York, Boston, Philadelphia, Amsterdam, and London. Colin has played complete cycles of the Bach Solo Suites at Wigmore Hall, the Chamber Music Society of Lincoln Center, Boston’s Gardner Museum and in Montreal, Toronto, Ottawa, Vancouver and, last year, in Winnipeg. This season, he is performing the suites more than 20 times in the USA, Europe, and Asia. As a member of the Golub-Kaplan-Carr Trio, he recorded and toured extensively for 20 years. He is a frequent visitor to chamber music festivals worldwide and has appeared often as a guest with the Guarneri and Emerson string quartets and with other ensembles. Recent CD releases include the complete Bach suites on the Wigmore Live label and the complete Beethoven sonatas and variations on the MSR Classics label with Thomas Sauer. Colin is the winner of many prestigious international awards, including the Gregor Piatigorsky Memorial Award, First Prize in the Naumburg Competition, and Second Prize in the Rostropovich International Cello Competition. When he was eight, Colin attended the Yehudi Menuhin School, where he studied with Maurice Gendron and later William Pleeth. He was made a professor at the Royal Academy of Music in 1998, having been on the faculty of the New England Conservatory in Boston for 16 years. In 1998, St. John’s College, Oxford created the post of ‘Musician in Residence’ for him, and since 2002 he has been a professor at New York’s Stony Brook University. Colin’s cello was made by Matteo Gofriller in Venice in 1730. He lives with his wife Caroline and three children in an old house outside Oxford. Once Vaughan Williams tapped into his native England’s rich vein of folk song and the magnificent heritage of its Tudor-era music, he began developing a personal style, something that had previously eluded him. The warmth, spirituality, and humour of these sources played significant roles in many of his subsequent compositions. At the same time, and with equal skill, he regularly produced abstract works, several of which (the fourth and sixth of his nine symphonies, for example) display with considerable power a darker, more pessimistic and more internationalist side of his creative personality. He published Suite of Six Short Pieces for solo piano in 1921. Two years later, James Brown, editor of the Polychordia String Library, transcribed it for string orchestra, with the blessing and the collaboration of the composer. At that time, the title was changed to The Charterhouse Suite. The title refers to a venerable public school that had been founded in the town of Godalming, Surrey in 1611. The teenaged Vaughan Williams studied there from 1887 to 1890. The scoring for strings is rich and enjoyably varied, and the music itself is utterly charming. The Prelude is lively and tuneful. Slow Dance brings music of heartfelt expression, while the third movement, Quick Dance, has energy to spare. The expressive core of the suite comes in the longest section, the lovely fourth movement, Slow Air, with its poignant violin solo. The fifth movement, Rondo, is moderate in tempo and gracious in character. The finale, Pezzo ostinato, provides a satisfying mix of the lively and the majestic. Like so many Soviet/Russian cello works, Shostakovich’s two cello concertos were inspired by and dedicated to the eminent soloist, Mstislav Rostropovich. Shostakovich knew that Rostropovich wished dearly to receive a concerto from him, but the composer’s wife warned the soloist never to mention it. She knew it would appear only when the time was right. That time proved to be the summer of 1959. Rostropovich recalled that, “When I learned that Shostakovich had finished the Cello Concerto, I immediately went up to Leningrad. I received the score on the evening of 2 August, and I learned the work in four days exactly. I practiced for 10 hours the first day, and had the score memorized in three days. It was the most wonderful pleasure for me. “Then I went to Shostakovich’s dacha in Komarovo outside Leningrad to play the concerto through to him. He said, ‘Now just hang on a minute while I find a music stand for you …’ I had been waiting for this and said, ‘Dmitri Dmitrievich, but I don’t need a stand.’ He said, ‘What do you mean, you don’t need a stand?’ ‘You know, I’ll play from memory.’ ‘Impossible, impossible …’” The play-through proceeded and gave complete satisfaction to composer and soloist alike. The first performance took place on 4 October 1959 with Yevgeny Mravinsky conducting the Leningrad Philharmonic Orchestra. It has been performed and recorded by a “who’s who” of modern cellists, including Yo-Yo Ma, Heinrich Schiff, Mischa Maisky, Lynn Harrell, Paul Tortelier, Steven Isserlis, and János Starker. An undercurrent of satiric humour runs through the opening movement. Over a march-like beat, the soloist, who is given scarcely a bar of rest, engages in dialogues with various sections and soloists of the orchestra. The remainder of the concerto is played as a continuous whole. The slow movement is mournful and highly expressive. It leads into a solo cadenza of harrowing difficulty, followed by the exuberant, at times caustic, revels of the finale. Shostakovich told Rostropovich that the last movement contains veiled references, presumably for satirical purposes, to Suliko, Soviet dictator Joseph Stalin’s favourite song. The careers of Janáček and his contemporaries Gustav Mahler and Jean Sibelius straddle the close of the Romantic era and the beginnings of modernism. All three drew upon both of these schools to create fascinating hybrid styles. Janáček’s music is very much his own: quirky, mercurial, and bursting with inventiveness and sharp contrasts of many varieties. Though pressed to follow family tradition and become a schoolteacher, his love of music could not be denied. His early works display clear influences of Antonín Dvořák (with whom he developed a close friendship) and Richard Wagner. Research into the earthy, spontaneous folk music of his native country proved a decisive influence on the already deeply patriotic composer. Despite long years of sustained effort, he gained success only gradually. His final years saw a tremendous resurgence in creativity, brought about in large measure by a passionate (albeit platonic) relationship with Kamila Stösslová, a much younger woman. This period also brought him the greatest acclaim of his career. Janáček’s most significant compositions are nine operas, compelling works marked by powerful emotions and melodies patterned on the rhythms of speech. Only Jenufa (Jealousy, 1904), has won lasting international success. Other major scores include numerous choral works and the spectacular Glagolitic Mass (1926) for chorus and orchestra. He composed a handful of symphonic poems in the mold of Liszt and Smetana, but his most significant orchestral works are the vivid rhapsody Taras Bulba and the spectacular Sinfonietta. Listeners who might not care for his fully mature works will likely respond favourably to the Idyll for String Orchestra. This early work is immediately attractive, solidly grounded in the nineteenth-century school of nationalist folk-flavoured romanticism. He composed it during a holiday in Bavaria in the summer of 1878, when he was 24. It, and the Suite for String Orchestra that he had created the previous year, demonstrated clearly his acquaintance with the music of Dvořák. Janáček had conducted Dvořák’s enchanting Serenade for Strings (1875) in Brno in 1877. Originally it had six movements, concluding with the scherzo, until Janáček added a new finale. The first movement is moderate in tempo, solemn yet warmly expressive in feeling. The second is animated, sweet, and innocent. A darkly coloured, almost poignant meditation follows. The outer panels were inspired by a boat ride that Janáček had taken during his recent visit to Bavaria. The fourth movement, with the tempo marking Allegro, is strongly rhythmic. The heart of the score lies in the fifth and longest movement, tempo Adagio, which resembles a lullaby. In terms of form, it is a dumka, a Ukrainian folk dance much loved by Dvořák. His Piano Trio in E Minor, Op. 90 (1891) consists of six dumky. In a dumka, slow and quick passages alternate, sometimes abruptly. A sunny, tuneful scherzo firmly drives away the dumka’s gloomy sentiments, although not without a touch of wistfulness in the central section. Animation continues in the finale, this time with a texture that sometimes has the intimate transparency of chamber music. The Idyll received its first performance in Brno on 15 December 1878, conducted by the composer. Dvořák attended the concert and must have felt grateful for the inclusion of some of his recently composed first set of Slavonic Dances. The score of the Idyll disappeared shortly thereafter. It was lost until it resurfaced in 1938, and was published in 1951.